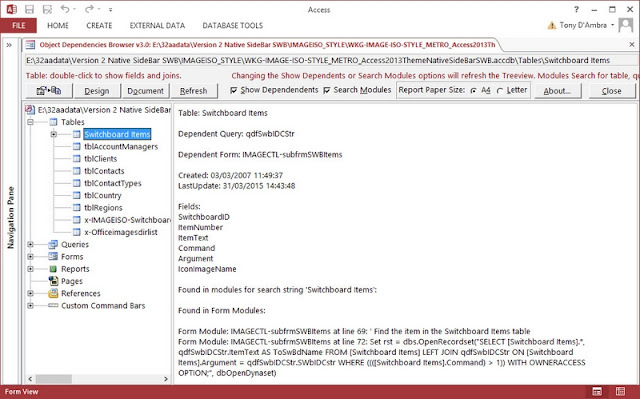 Version 3.0 of Object Dependency Browser for Access 2007-2013 (ODB) has just been released. ODB v3.0 adds the option of showing object dependencies for table, query, form, report and commandbar objects in all VBA modules, returning the module name, the line number, and the full line of text for each instance. ODB is the easy way to explore all objects, object collections, and dependencies of your Access database. objects that I depend on. The two dependency views are integrated in the one treeview. For example, ODB displays not only the fields collection for a table, but linked tables and joins, and all other objects in the database that depend on that table. Clicking on a join field will show the related to table/field and the type of join. Copy all object details from the properties pane to the Windows clipboard by clicking the Copy to Clipboard button. Object Dependency Browser is still only US$39.95.